As a classical Indian Kathak dancer, we would often be told by our guru (teacher) to listen to classical music like Ravi Shankar. 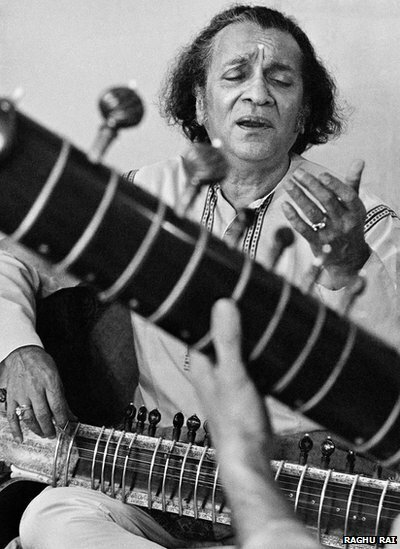 Ravi Shankar's talent in playing the sitar is magnificent and being that he passed away at the age of 92 he lived a good life, or so it seemed with his stage presence. I am actually very excited because on January 25, 2013 is the day I will be holding a charity event for an organization called One! International. They teach literacy to children in the slums of Mumbai and one of the performances for the evening is a sitar piece by a man I've known for many years, Joshua Stanton. Joshua has the same grace as Ravi Shankar had. I can't wait for all of you to see him perform. Have a wonderful weekend, great people. Where can I find details about your event? Sounds awesome!